As a Sage 200 and Sage Live Partner, we deal with a lot of clients who are moving on from Sage 50. And often we fine that the majority of users are quite happy with 50! It is simple to use and yet has good functionality. So, why do they decide that it is time to bite the bullet and move on? One of the most common issues we hear is reporting. As businesses grow and develop, visibility across the business becomes absolutely vital. Unfortunately, the level of depth in reporting is quite limited. For those companies that are happy with Sage 50’s functionality or are not ready to move into a bigger package, there has to be a better way of getting data out of the system. It is for this reason, that we decided to introduce i50. i50 is brand new reporting package from itas. There are different elements to the product, but effectively what the system does is allow you pull your Sage 50 data into Microsoft Power BI for analysis. This is made possible by the i50 Connector. The connector pulls your Sage 50 data out, and into Power BI through and API. This means, that anything you put into Sage 50, you can get out of i50. The best part about this is that your analysis can then be done through Power BI – Microsoft’s free analysis tool. As of June 2017, you can even become a Power BI Pro Member for free, for 12 months. The i50 Connector is available from just £49.99 per month. 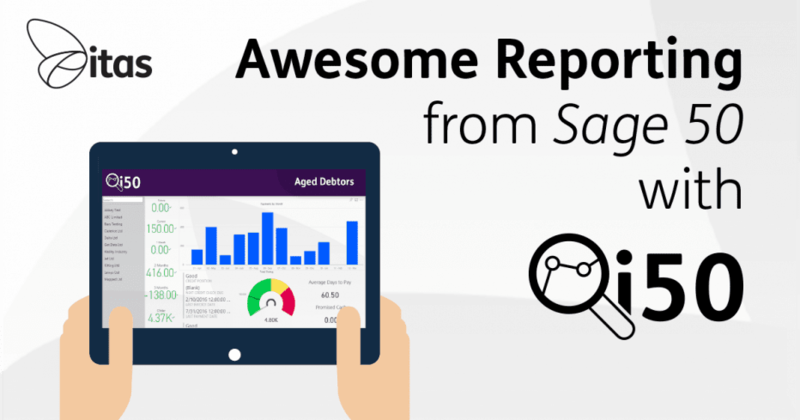 Perfect for those of you who just want the data – you are then free to create as many weird and wonderful reports & dashboards as your heart desires. As I mentioned previously, the i50 connector pulls your data into the API. Allowing you to view the data in its simplest format. Now, it is up to you how you move forward with this – you could copy and paste that data into Excel or another analytics tool. But, our advice would be to use Microsoft’s Power BI. Power BI is a free data analytics tool that allows you to pull the data straight in. No copy and pasting necessary! At first glance, any analytics tools can feel overwhelming but if you want to be able to produce your own reports & dashboards it may be worth getting some Power BI Training. We offer a range of training courses, all approved by our TAP Accredited trainer. So, if you are interested in Power BI Training click here for more information! The first package available, is what we call the Financials Package. This includes a range of reports, including Sales & Purchase Ledger Analysis, Sales & Purchase by Customer/Supplier, Nominal Reports, Age Debt Dashboards. All the reports are customisable, and allow for drill down into the data. The second package is our Commercials Package. This includes a Warehouse Dashboard showing things like incoming Sales Orders, outgoing Purchase Orders, Stock Items below reorder level. It also contains a Sales Order/Purchase Order Activity Report. This will shows number of orders by month, values of orders giving you a comprehensive overview of what is happening within the business. All of the reports and dashboards can be branded with your company logo and colours and are available on mobile as well as desktop. Of course, if you want us to build other reports/dashboards for you then just ask! We love a challenge!! i50 can be yours from as little as £49.99 a month. Imagine, no more printing off multiple Sage reports. No more excel manipulation. 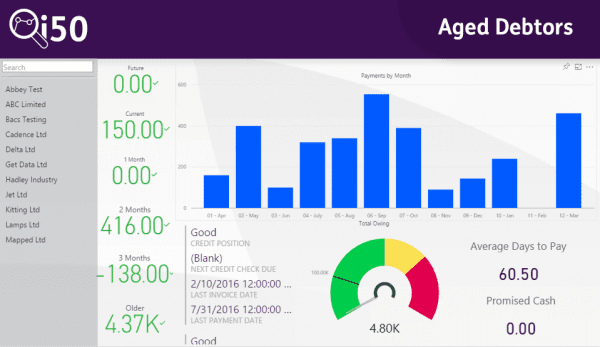 You just log into Power BI, flick to your Aged Debt Dashboard and see how much is outstanding, who your worst customers are for outstanding amount, time to pay. You don’t even have to be in the office! Open up the Power BI App and check your Sales for the month so far. If you would like more information on pricing or how you can get your hands on Power BI, head over to our i50 page!